This is a 'sookhi sevaiyyan' or 'sevaiyon ka muzaffar' baked to perfection. Yes baked. Sevaiyyan is a very thin vermicelli dish that can be made like a thin milky porridge or like a crisp chewy kind of sweet pudding. Actually the taste and the texture is not at all comparable to any other dessert that I know. Sookhi sevaiyyan is known by those who have enjoyed it in real life. I have remembered and missed the sookhi sevaiyyan that we used to have at our friend's places. It was never made at our home though the sheer khurma (the thin milky version) was very common. But as I understand, these recipes have been a common culture of our land even though these are made basically on religious festivals. So this sookhi sevaiyyan and pheni will be enjoyed in Muslim homes on Eid and Bakrid while it was made for festivals like Teej Hindu homes. How we have weaved food with our festivals. Caste and religion no bar when it comes to food, we keep waiting for all sorts of festivals just for the spread of different types of food we get to eat. So much so that we associate festivals with food only, not knowing the cultural details of a festival. A friend's grandmother used to make gujhia stuffed with this kind of sookhi sevaiyyan, I still have that taste lingering somewhere in my memory. This was a Hindu version suited for teej festival that comes soon after Eid. The sookhi sevaiyyan made at Muslim friend's homes was decadent and I kept wondering how they get that dry caramelised texture with perfectly cooked khoya and lightly fried nuts. Probably my mother never learned how to cook it, and we remained deprived. I tried replicating the same texture and taste using the pheni (or feni) sometimes and was pleased with the result, but making it from the thin vermicelli was difficult, it will either get too soft or too dry for my liking. Although, this sookhi sevaiyyan can be made in all variations of textures as I have tasted some really soggy ones too, and a few really really dry textured too. I wanted to make it to my liking, the way I remembered it from my friend's home. I got a good quality pack of sevaiyyan (thin vermicelli) from Rupak stores, these are pre roasted vermicelli so there is no need to slow roast them in ghee. 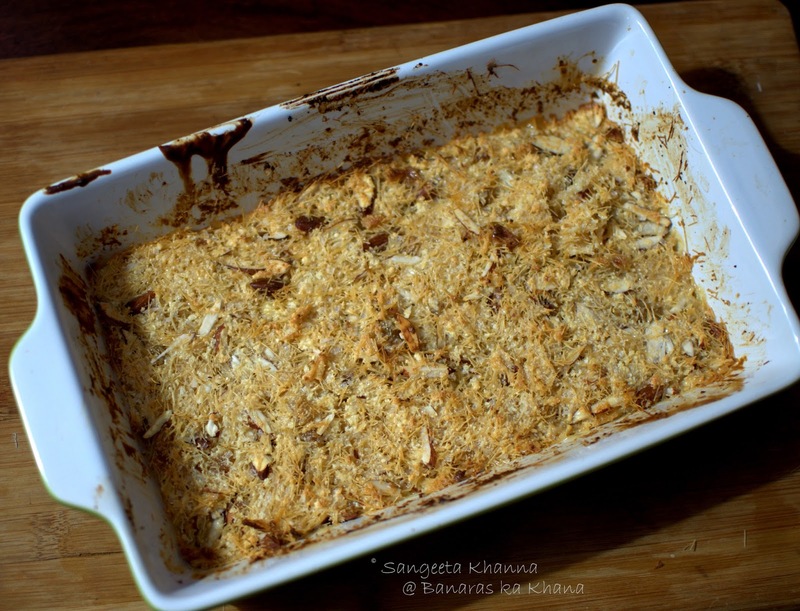 This got me thinking and I planned a baked sevaiyyan as this would result in slow caramelisation of the sugar added and the milk sugar both. This was a perfect decision as the result was very very close to what I had in my head all these years. And, the total preparation plus cooking time for about 4-5 servings was 20 minutes. I am thrilled. Roast the vermicelli with minimal ghee if they are not pre roasted. Keep aside. Place the milk powder and water in a glass or ceramic bowl, mix well and microwave for 2 minutes. Stir well again and microwave for a minute again. Repeat this once more. The milk solids become granular now and taste and smell like khoya. 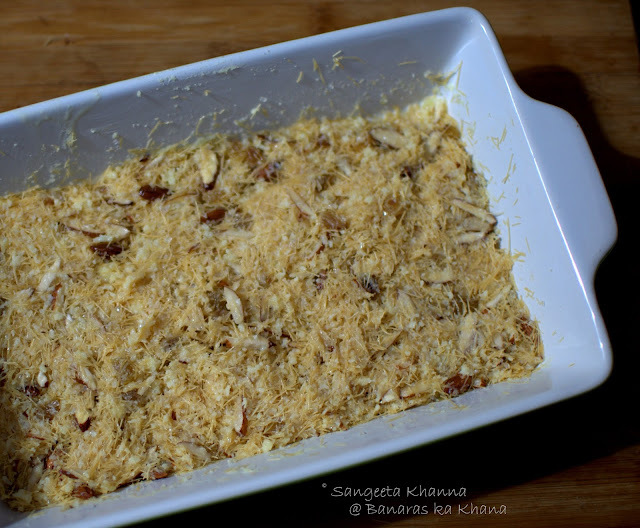 See this procedure of home made khoya in microwave to get a step wise idea of how to do it.. I did the khoya making in the baking tray I used for baking the sevaiyyan, it got a bit stained with all the stirring but lesser utensils used is a better idea. Now break the sevaiyyan into this khoya, add everything else and mash using your fingers. Pour in the milk and malai (or fresh cream) slowly to incorporate and dampen the dry vermicelli. Now press down everything in a thin layer, about 2.5 cm thick. Choosing a suitably sized baking pan or dish will be advisable. 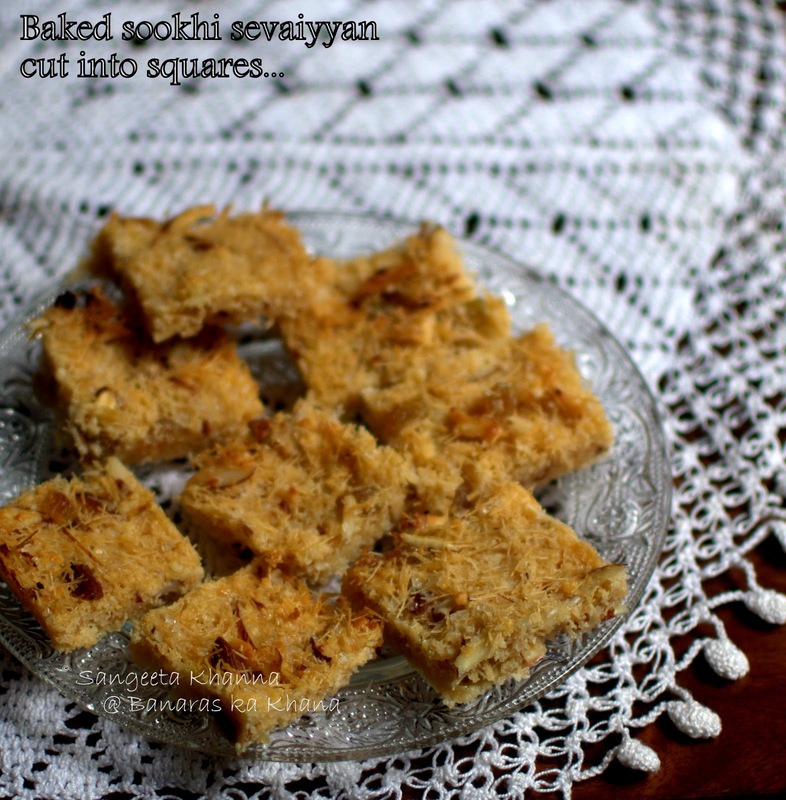 The sevaiyyan gets dehydrated, caramelised and becomes a bit thinner after baking. Now slide the tray/dish into the oven and bake at 180 C for about 8 minutes. I had not preheated the oven and it took 8 minutes at 200 C.
This is served warm or at room temperature. 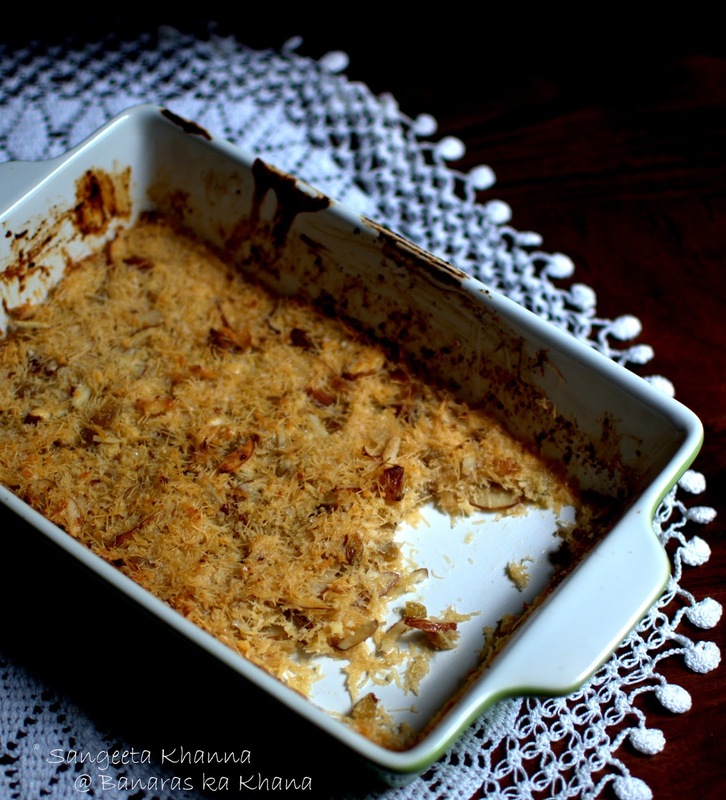 The decadent flavors of caramelised milk around thin strands of vermicelli is awesome. 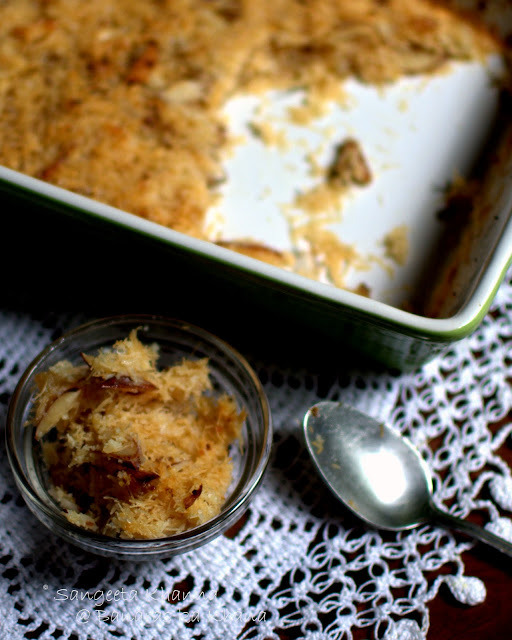 The perfect chewy interiors and crisp crust makes it a perfect baked desserts if you are serving it at a party. Just mix everything, press down in the baking dish and refrigerate. Bake when required. Cut in squares for the ease of serving..
Or just gnaw away from the baking dish. It keeps well at room temperature for 3-4 days, 2 weeks when refrigerated. Can be cut into fudge like squares so it is easier to serve. But the crisp texture of the crust wouldn't be there when you keep it for long. This was the closest to the sevaiyyan I have had at my dear friend's homes. The ones I loved, I quickly forget the food I haven't liked so they don't exist for me. All bad versions of sookhi sevaiyyan were never given a chance by my memory. Now this one would keep the memories alive, make more memories and some more happy meals with friends and family. aah, These look tempting. Please do suggest the most useful brand of dry vermicelli that can be used with this recipe. I really want to try it out. I'm waiting for feni season to come by to buy feni at the local sweet shop , theni can try your feni dry too.